See also: one of the best mysteries I've read in quite a while. Larry D. Sweazy is an award-winning author of westerns, but the first of his Marjorie Trumaine mysteries is a winner as well. See Also Murder introduces an unusual amateur sleuth, and puts her into a gritty environment, the plains of North Dakota in 1964. It's a tough life for anyone, but Marjorie Trumaine has a rougher life than most. Marjorie never wanted to live anywhere else or be anything more than farm wife to her beloved husband, Hank. They had gone through some rough times, and Marjorie learned to be an indexer to make extra money. Then a tragic hunting accident left Hank blinded and paralyzed, unable to farm. Marjorie was left to keep the house and farm going with help from the farm boys next door, Jaeger and Peter Knudsen. She was barely keeping her head above water when someone killed her neighbors, Erik and Lida Knudsen, slaying them while they slept, leaving their sons to find them in the morning. When Sheriff Hilo Jenkins informed her of the murders, he also asked for Marjorie's help. He knew as an indexer she would be fascinated by the story behind an unusual amulet. In Marjorie's eyes, that amulet leads to nothing but trouble, as more murders occur, and she feels isolated, as if she's being followed, and alone. Sweazy's book is gritty, but not in the graphic sense used in most novels. It's the lifestyle on the plains in 1964. The characters lead a tough life, trying to eke out a living in an unforgiving environment. And, maybe that's the best description of the setting and the story, unforgiving. It's a beautifully written, atmospheric story that reminds me of some of my favorite mysteries, ones that set a stage that is uniquely theirs. It takes me back to the first time I read Jonathan King's The Blue Edge of Midnight, set in the Everglades, or Donis Casey's Oklahoma mysteries. These stories all evoke a strong sense of place that is vital to the story. And, it takes just a few phrases to set the time frame; the party line, Marjorie's typewriter, the fear of the Communists and nuclear war. It's a mystery perfectly set in its location and time period. In Marjorie Trumaine, Sweazy has created an unusual character. She's a woman in a job that requires isolation and quiet, an indexer. But, she's forced into that environment as well, living with a man confined to his bed, who seldom talks, and wishes he could die. She's far from any neighbor, alone on the farm. She's a woman who forces herself to take action and appear strong, while she is lonely, cries in the truck by herself, and smokes under stress, hiding it from her husband. And, she depends on the border collie, Shep, for protection and comfort. 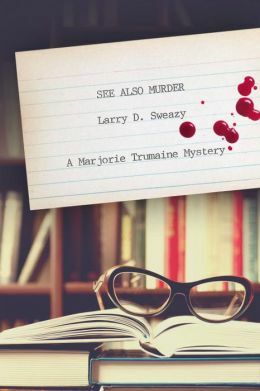 Anyone who appreciates a solid mystery with an intelligent amateur sleuth who confronts the problems of life and death under harsh conditions should pick up See Also Murder by Larry D. Sweazy. I'd file it under See Also Outstanding Crime Novel. See Also Murder by Larry D. Sweazy. Seventh Street Books. 2015. ISBN 9781633880061 (paperback), 250p. More and more, it's characters that intrigue me and this sounds like a winner. Also, the setting is someplace I know nothing about, so thanks for this, Lesa! You're welcome, Clea. Marjorie is a fascinating character. As you said, a setting I knew nothing about. Terrific book! I think I would love this book. Thank you for the intro, Lesa! You're welcome, Reine. If you read it, let me know what you thought. Wonderful review, Lesa. This one is going on my "to buy" list right away. Hugs to you and the kitties! Thank you, Beth! Hugs back as well. I need to write you a letter. Nothing wrong. Just a catch-up, even though you've seen it all on Facebook. Hugs!